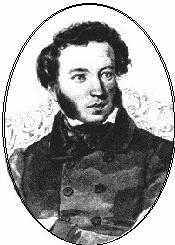 ﻿ Poetry Lovers' Page - Aleksandr Pushkin: "Suppose That You Won..."
You are here: Home » Russian Poets » Aleksandr Pushkin » "Suppose That You Won..."
From "To my friend, the verse-monger"
Then, with much pleasure, they would read your books. And eat and sleep, appeased, just lying on your side? Are 'splendid halls and castles for 'immortals'. Their life -- an endless plight, and their fame -- a dream.